Thousands gathered for the 2013 Kitchen and Bath Industry Show in New Orleans. We've put together a list of the newest trends and products in kitchen and bath from the show. Here's #1 on the list! Gorgeous in Grey. A big trend in cabinet design is sleek, sophisticated grey cabinetry. Elmwood Cabinetry has many custom styles and finishes available like the kitchen images shown here with two shades of grey coming together to make an elegant statement. 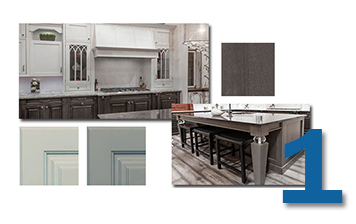 Shiloh Cabinetry offers Dove Grey and Platinum paint (pictured lower left). They also offer Silas -- a grey stain (pictured upper right). The Silas stain looks great with a graphite grey highlight.